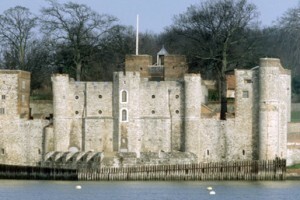 Upnor Castle, on the banks of River Medway, is a rare example of an Elizabethan artillery fort built to protect warships moored at Chatham dockyards. The gatehouse and main body of the castle are open for viewing. The gardens slope gently towards the river and are the perfect place to enjoy a cup of tea and Slim Sam’s cakes which are available in the shop.